We've known for a while now that Huawei is prepping a new flagship phone with a two-camera setup – the Huawei Honor 6 Plus – and a teaser posted on the company's Weibo account reveals that it'll be announced on December 16th. 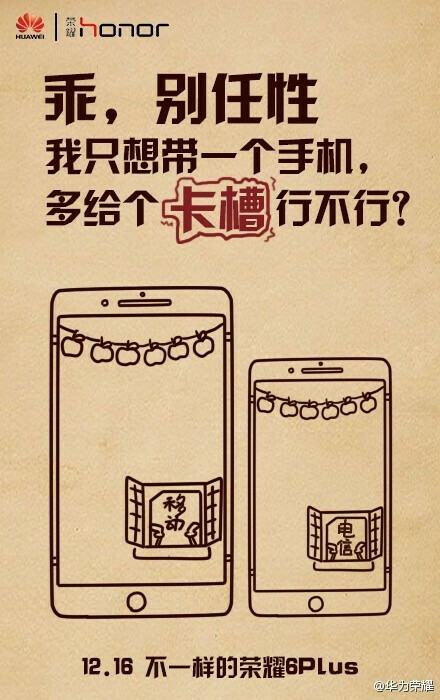 The posted image itself doesn't divulge too much beyond the date, though it seems likely that Huawei is gunning for Apple's iPhone 6 Plus, and that makes some kind of sense considering the two handsets' similar names and sizes. That said, the Chinese blogosphere is speculating that the phone's price tag will likely be around ¥1999, or the equivalent of $323, at least in their homeland, which is far less than an iPhone 6 Plus costs. In terms of specs, so far we know that the display will measure 5.5-inches and have a resolution of 1080 x 1920, good for 401 pixels per inch. The processor is expected to be one of Huawei's own Kirin 925 – an octa-core chip with four+four ARM Cortex-A7 and Cortex-A15 CPUs working in an ARM big.LITTLE configuration. The rest of the specs include 3GB of RAM, a hearty 3,500 mAh battery, and, of course, the aforementioned dual 8-megapixel camera setup that will allow for some fancy, non-faux bokeh effects (examples below). Considering how much we liked the Huawei Honor 6, more about which you can read here, we're expecting even more from the Plus model. Hopefully, we're right – Huawei sure could use a boost in sales. First HTC did the Dual camera, now Huawei and i hear next year Apple is copying it. i thought everyone said its a gimmick? Except that HTC had poor implementation. It seems to say that it will have an extra SIM-Card or SD Card slot.